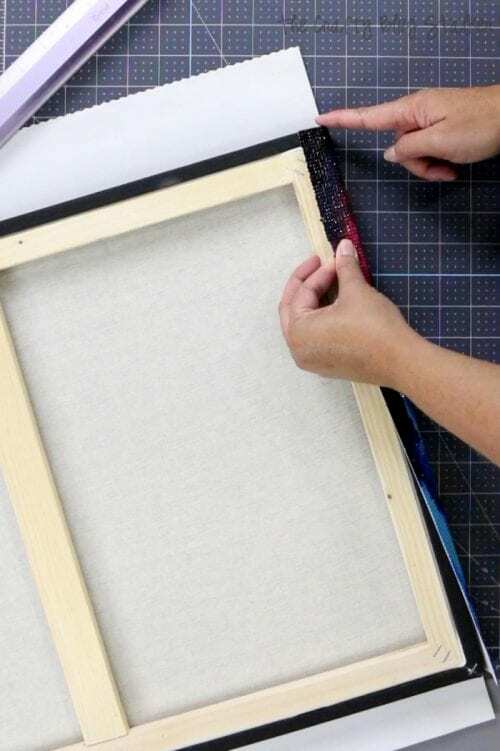 Learn how to frame diamond art! This is an easy DIY craft tutorial idea on how to finish your diamond art and display as home decor. Did you see my post yesterday, How to Make Diamond Art with Diamond Art Club? I am obsessed with Diamond art and now that I have finished this one, I am so excited to get started on my next one! Make sure to click through to the post if you want more information. Today I am going to show you how to frame finished Diamond Art. 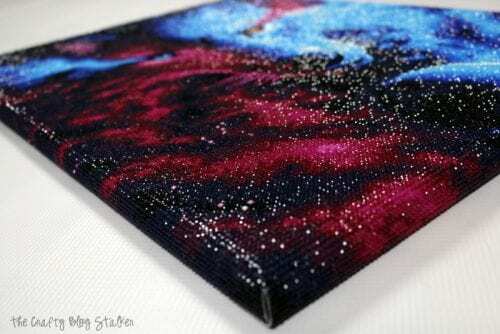 I am going to use an art Canvas and wrap the edges so you can see the diamonds on the side of the canvas too! 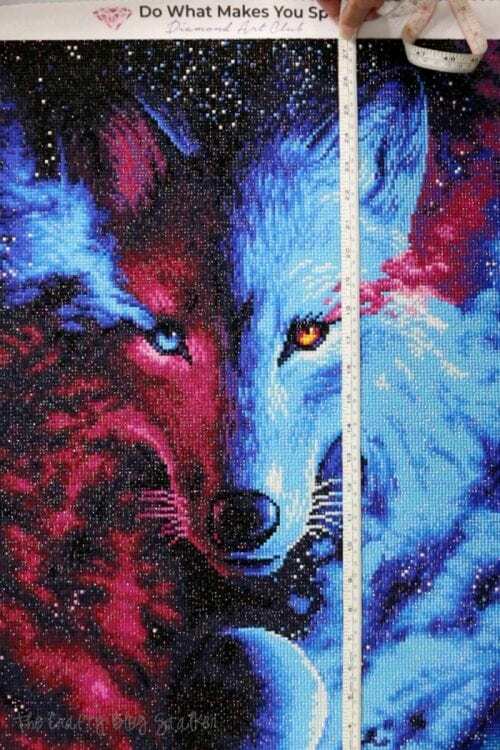 Before you purchase your canvas, you will want to measure and know the finished size of your diamond art. The canvas you choose should be smaller than the finished art. 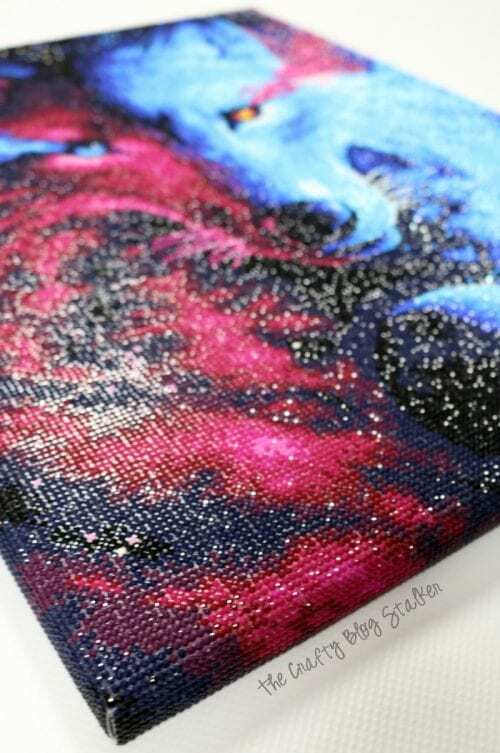 That way you can wrap the edges around the canvas and still have those sparkling diamonds on the side of the canvas. As a heads up, I am not measuring anything. If you would like to measure so you get it perfectly centered you totally can! 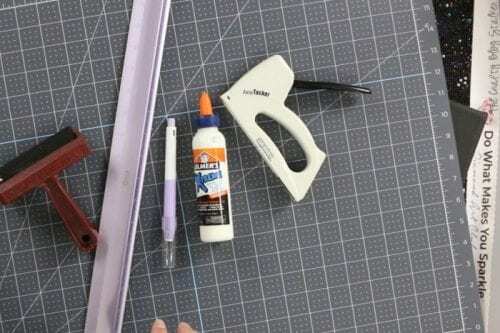 To begin, cover the canvas with glue. 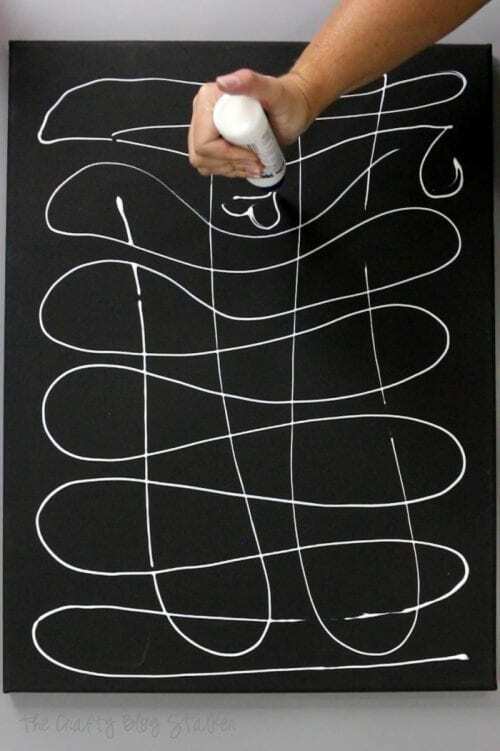 You do not want a fast drying glue because you want to be able to move the diamond art around before it dries completely. 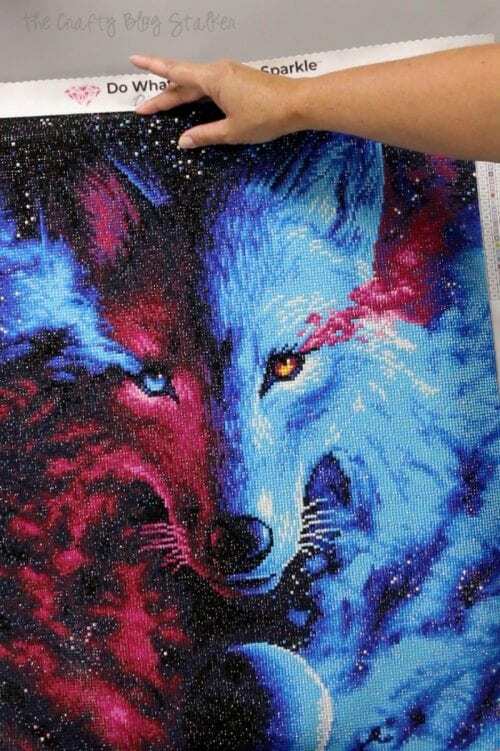 Carefully lay the diamond art over the top of the canvas and eyeball center. Work quickly, and while the glue is still wet press the edges of the diamond art down over the edges of the canvas and slide the art until it is right where you want it. Once the art is right where you want it, use the brayer to push the art into the glue and canvas. Turn over and brayer the backside as well. 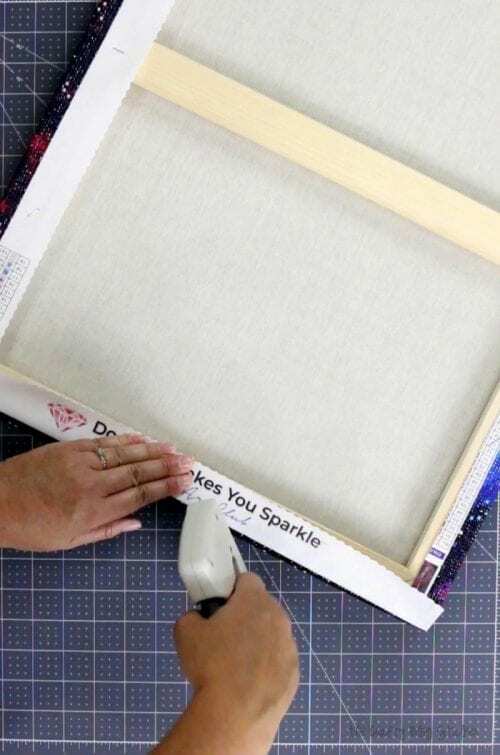 Place the diamond canvas upside down on a cutting mat. 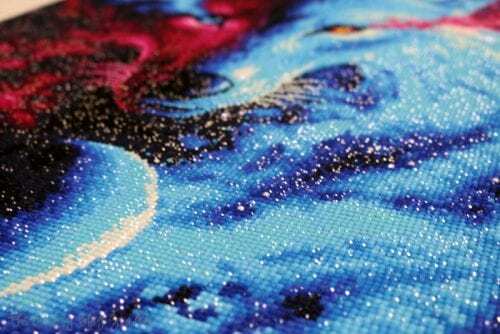 Trim the edges of the diamond art so they stick out about 2 inches from the edge of the canvas. Next, we want to prep the corners for wrapping around the canvas. Line the ruler against the canvas and with a craft knife cut from the edge of the canvas to the outer edge of the diamond art. Do this against each side of the canvas and then remove the rectangle out of each corner. Do this on all four corners. To wrap, tightly pull up the edges of the diamond art around the canvas. 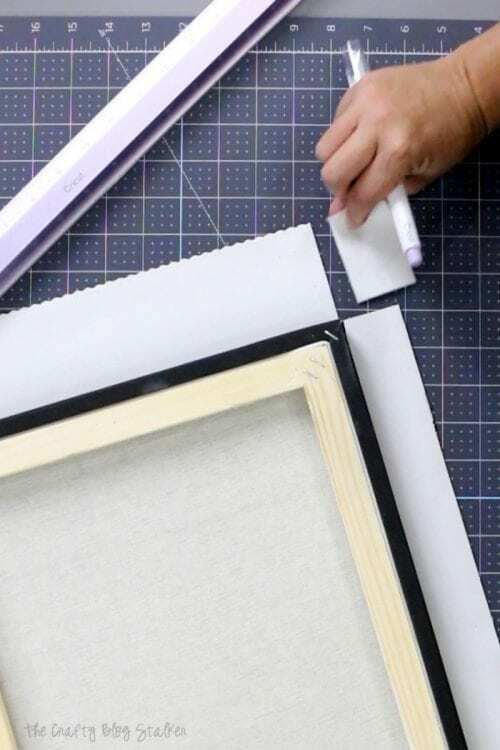 Make sure the staples are going through the wood frame of the canvas, not the canvas itself and put five staples on each side. I started with the middle, then each end then the two center sections. Then, turn the piece over and see your finished work of art! I absolutely LOVE how it looks! You can see how well the corners wrapped around the canvas as well as the sides! I think I definitely need to make more Diamond Art! Click Here to shop the Diamond Art Club to make your own Diamond Art! 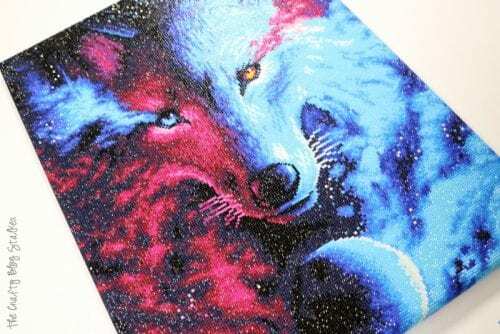 Have you ever tried Diamond Art? Comment and share below! 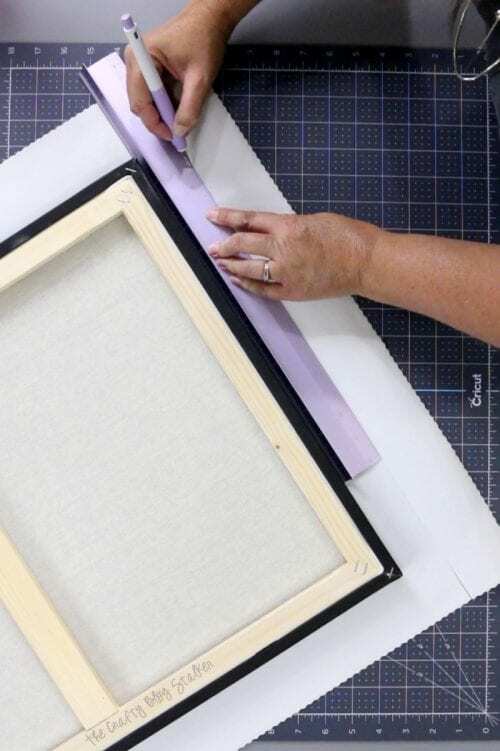 SAVE HOW TO FRAME DIAMOND ART TO YOUR FAVORITE PINTEREST BOARD! I love this video. You make it look so easy! My biggest concern is when you cut the ends off, won’t a lot of the diamonds pop off? I seem to have problems getting mine to stay down. I have been using a piece of waxed paper and a rolling pin. Do you have any other suggestions? Do you ever seal them with anything? When I was cutting and wrapping around the canvas a couple of the plastic diamonds did fall off. I was able to reapply them to where they fell off and they have stayed stuck. I have not tried sealing the plastic diamonds but I would imagine a good coat of Mod Podge would do the trick. 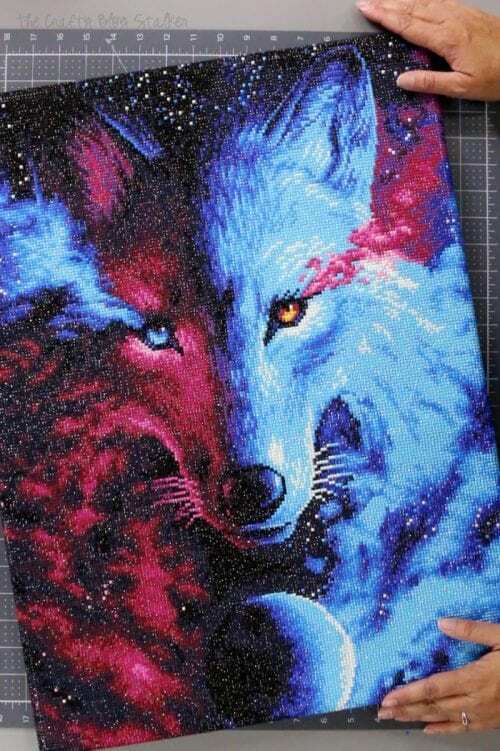 I have done a couple of different brands of diamond art and Diamond Art Club is my favorite. I think they have the highest quality product and the diamonds stick the best. I’ve watched quite a few videos with test on different sealing techniques on diamond art. Modge podge will give a shine, but you won’t get the “sparkle” like normal. Tombow Aqua glue keeps the shimmering sparkle! I tried it on the first small painting I did and it worked, so I did it on the first large one I made. If you search on youtube, you will find videos on how to apply it. You do go through quite a bit of it, but well worth it to ensure your diamonds won’t pop off. Thank you, Kevin, for doing the homework for us! 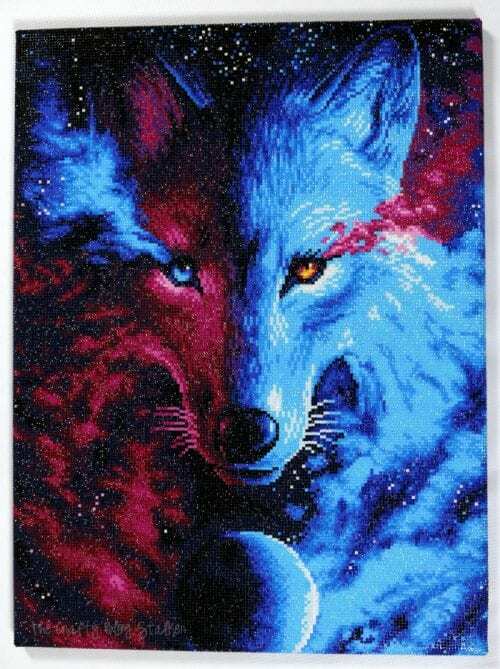 I would just like to know where to buy the canvas and how do you determine what size you will need ? You can buy the canvas at any craft store, Walmart, or online like Amazon. 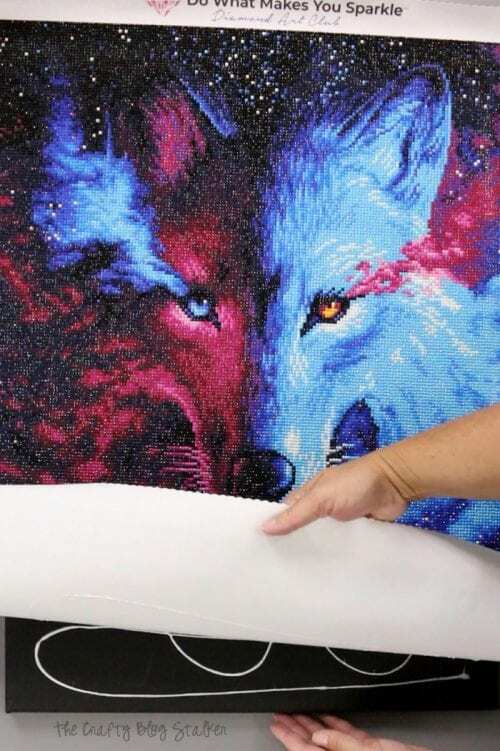 Since you are wrapping the diamond art around the canvas, you will want to purchase a canvas that is about 3 inches smaller than the finished diamond art.